want to make your own Christmas ornaments? we have a nice and easy one for you today. 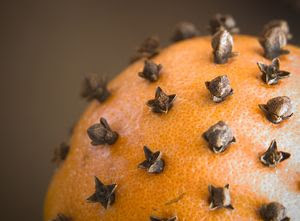 The idea is to pierce the ball shape with the cloves. you can either fill the whole circle or do designs with them. Then put it in a nice plate and use it as a centerpiece, or put a lace around it and hang it from your tree.